The kids' bathroom makeover is officially complete. Today I switched out the brass door hardware with oil rubbed bronze knobs and hinges. I think it helps complete the vintage, cottage look I was trying to achieve. The nasty shower faucet was replaced with a satin nickel one. This was a huge undertaking, requiring several trips to Home Depot and Lowe's. The original Kohler faucet was over 20 years old, and there are no trim kits on the market today that work with the old fittings. So instead of swapping out the pieces easily, a hole had to be cut in the wall of my son's bedroom to access the plumbing and replace everything. Thank you, Kohler. Out of spite, I went with a Delta faucet :) Truthfully, it isn't the most attractive one, but it's fine. 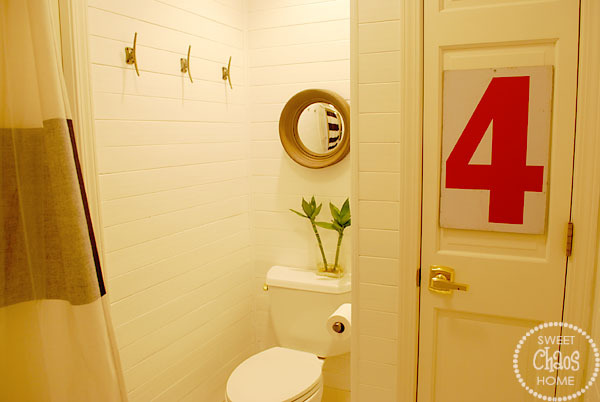 It's a boys' bathroom. And as long as there's hot water coming out of it, they're happy campers. And, I am a happy camper now that this room is done! Let's take a look at where it all began, shall we? 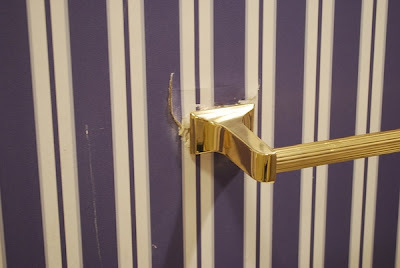 The makeover began when a broken towel bar caused the wallpaper to tear. I swear I had nothing to do with it! Even if I secretly wanted to get rid of the wallpaper. But, really, at this point what choice did I have? 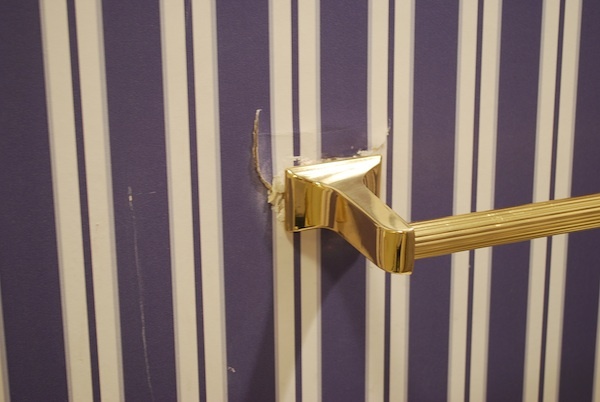 The wallpaper had to be taken down. 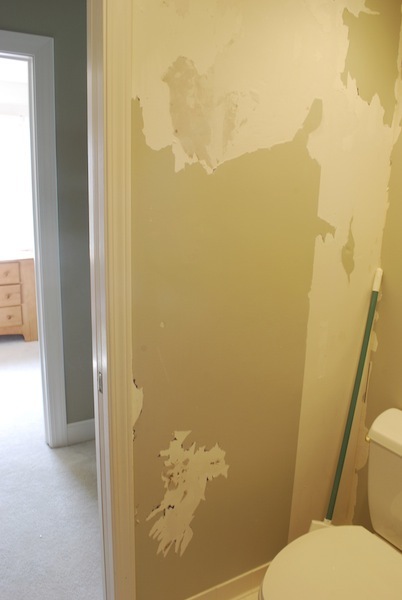 Since I had a bad case of tennis elbow, I hired someone to remove the wallpaper and paint the walls. Or so I thought. In the meantime... 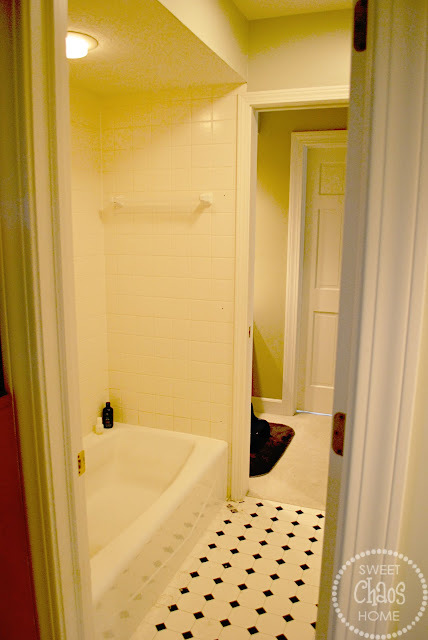 I was busy removing the ugly shower door, which you see below. When the door and track were removed, I had to patch some screw holes in the tile. 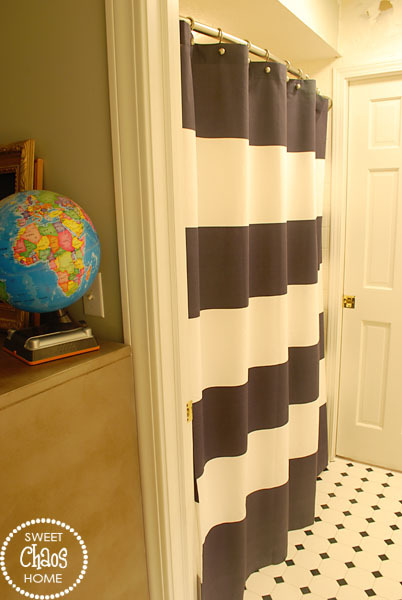 Then I was able to hang the new shower curtain. Back to the walls... it didn't take long to realize that it would be impossible to remove the painted wallpaper without killing myself in the process. I decided this would be a great time to try the planked walls I'd been wanting for a long time. After lots of priming and painting and caulking and sanding, the walls were complete. Then, I just added a few accessories. 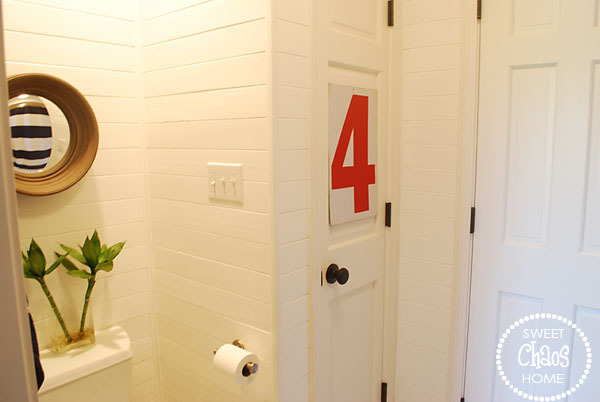 For such a small room, there were some BIG headaches involved in this project. Love all of it. Great idea with the planked walls. This room has come together so well. I love it all! 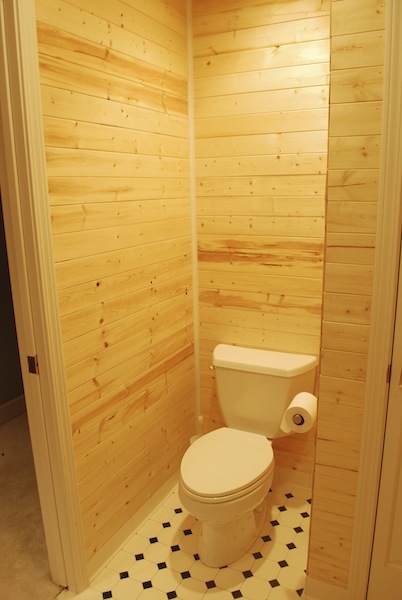 I LOVE the planked walls, perfect choice! The whole bathroom came together beautifully! 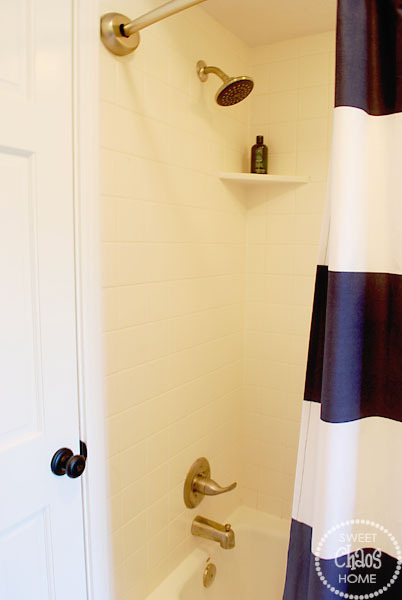 The plank walls and black & white tile look great together! What an awesome transformation!!! Love how it all turned out! 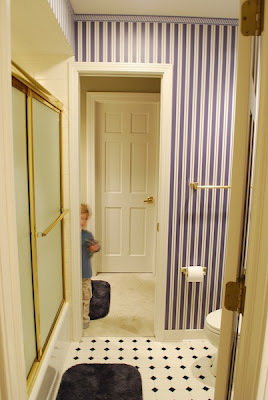 This is the style I prefer for my boys bathroom too, simple and fun! Looks great! I love the 4. Is it a vintage gas station number? 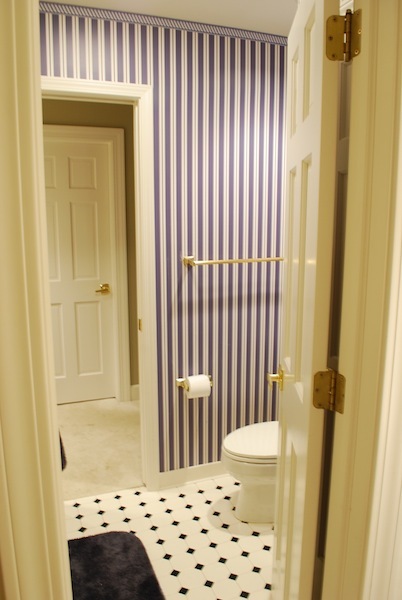 I love the bathroom makeover!! 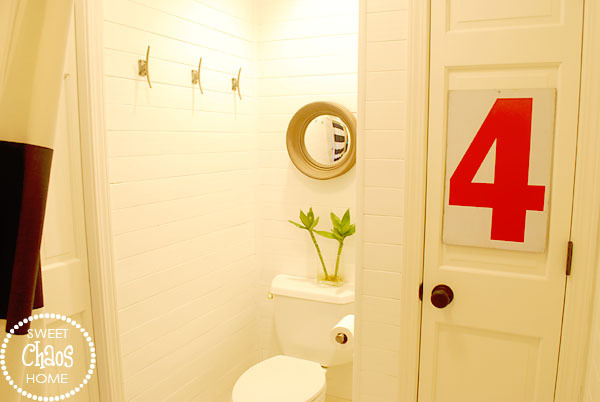 I especially like the planked walls, number 4 sign, and shower curtain! All so pretty! Wonderful job! So fantastic! I love it! What is the signifigance of the "4"? I think you did a wonderful job! 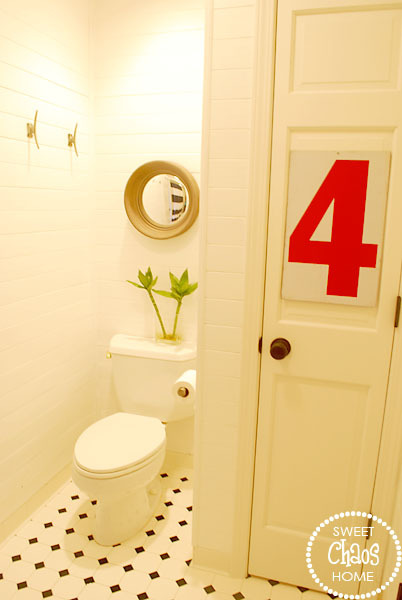 I absolutely love this bathroom. Fresh and clean! Love the 4.